22 Jan 2017 - 737-800, VT-JTD (30734/2477), FF Dec 2007, operated by Jet Airways was landing on runway 14 at Dhaka airport at around 0556 UTC. At the time of landing First officer was the pilot flying and PIC was the pilot monitoring. As the aircraft approached close to the runway, PIC observed that they were high on glide and immediately the corrective actions were taken by the First officer. On initial touchdown the aircraft bounced with nose-up attitude higher than the normal. Thereafter, PIC took over the controls aircraft touchdown in second attempt. Thereafter thrust reversers were deployed and aircraft exited the runway, taxied to the parking bay. After engines were shut down, AME was informed about the suspected hard landing. During the post flight walk around inspection at Dhaka, rubbing marks were observed on the tail skid and underbelly of the aircraft. Jet Airways Ltd. B 737-800 aircraft VT-JTD while operating flight 9W-276 (Mumbai to Dhaka) was involved in a serious incident at Dhaka on 22.01.2017 while landing. The aircraft was under the command of Captain holding ATPL with First officer holding CPL. There were a total of 160 passengers and 08 crew members including a supernumerary First Officer undergoing observation flight on board the aircraft. There was no fire and no injury to any of the occupants onboard the aircraft. The aircraft took off from Mumbai at around 0345 UTC and landed at Dhaka airport at around 0556 UTC. The enroute flight was uneventful. The weather at Dhaka at the time of landing was fine with visibility approx 1900 meters and winds 360/04 kts. At the time of landing First officer was the pilot flying and PIC was the pilot monitoring. First officer was carrying out assisted landing and both (PF & PM) were authorized for the above purpose. As per PIC, aircraft was stabilized by 1000 ft AFE in VMC on runway 14 with all checks completed. Also the landing clearance was obtained from Dhaka ATC. As the aircraft approached close to the runway, PIC observed that they were high on glide and immediately the corrective actions were taken by the First officer. On initial touchdown the aircraft bounced with nose-up attitude higher than the normal. Thereafter, PIC took over the controls and added thrust with simultaneous increase in pitch attitude. After thrust was added, takeoff configuration warning light was flashed followed by horn and aircraft touch down in second attempt. Thereafter thrust reversers were deployed and aircraft exited the runway, taxied to the parking bay. After engines were shut down, AME was informed about the suspected hard landing. During the post flight walk around inspection at Dhaka, rubbing marks were observed on the tail skid and underbelly of the aircraft was found damaged. Aircraft was grounded at Dhaka and next flight 9W-275 (Dhaka - Mumbai) was cancelled. After the incident at Dhaka, an engineering team from Mumbai visited Dhaka for the damage assessment and repair of the aircraft as Jet Airways Dhaka station is approved only for transit inspection and M/s Jet Airways has contract with (Biman) Bangladesh Airlines for all support of ground handling for the transit inspection. At Dhaka preliminary damage assessment was carried out by Jet Airways team and the damage report was provided to M/s Boeing Company with a request to provide temporary repair scheme for an unpressurised ferry flight to a suitable base for permanent repair. Temporary repair scheme was suggested by M/s Boeing Company, wherein doublers were installed on the damaged skin area and after that aircraft carried out an unpressurised ferry flight to Mumbai for permanent repair.  All the Gouge marks were located between STR (stringer) 27L & 27R, The skin scrap was deep and skin material was found missing at 3 frame stations.  At STA 907 frame location skin was missing between stringer 27 L & R. Material missing which was 8.27 inch in length and 1.7 inch in width. Also dent observed between station 887 & 907 is 0.6 inch deep.  At STA 887frame location skin was missing between stringer 27 L & R. Material missing which was 8.2 inch in length and 0.8 inch in width.  At STA 907 between STR 27L & R the shear Tie to frame attachment fastener sheared off , also at STR 27L stringer clip found buckled and shear tie was damaged.  The aircraft had an initial Power- On touchdown of 1.55 ‘g’ with a pitch attitude of 4.57 Degrees causing the aircraft to bounce for 2 feet in air, and Speed Brakes Deployed (air ground sensor sensing ground).  There was an increase in thrust of 64.88% followed by momentarily lowering the pitch attitude upto 2.11 degrees, with the speed brakes still being deployed.  The aircraft landed with a second touchdown of 2.79 ‘g’ and pitch attitude of 6.5 degrees. The crew carried out normal ILS DME approach for runway 18. After the approach was stabilized, PF initiated flare at the recommended Flare height but the thrust lever was not retarded to idle as required by the FCTM for landing, so it was a power on landing. The PF was not cautioned by the captain who was supervising the landing. On initial touchdown with a pitch attitude of 4.57 Degrees, ‘g’ of 1.55 was experienced causing the aircraft to bounce for 02 feet in air. Speed Brakes got deployed as the system sensed aircraft on ground. At this moment, Captain took over controls and increased thrust commanding 64.88% N1 to recover from bounce, this could have been avoided for small skip(As per the FCTM). The pitch was also lowered to 2.11 degrees and DFDR data shows speed brake to be still up. The aircraft touched down on wheels for the second time with a vertical acceleration of 2.79 ‘g’ and pitch attitude of 6.5 Degrees, speed brakes still up. A pitch up trend @ 3.42 degrees/ second continued with a maximum pitch angle of 9.67 degrees. Probably the main landing gear oleo strut which got compressed during the first touchdown might not have gone back to a fully extended position as it takes time, whereby reducing the distance between the bottom of fuselage of the aircraft and the ground at the time of second touchdown. The aircraft attitude due to the combination of all the above at the time of second touchdown resulted in the fuselage bottom rubbing the ground as observed after the incident.  On initial Power On touchdown with a pitch attitude of 4.57 Degrees, ‘g’ of 1.55 was experienced causing the aircraft to bounce for 2 feet in air. The Speed Brakes got deployed as the system sensed aircraft on ground.  PF initiated flare at the recommended Flare height but the thrust lever was not retarded to idle as recommended in the FCTM in order to achieve a smooth touchdown, resulting in a power on landing.  The Captain took over controls and increased thrust commanding 64.88% N1 to recover from bounce. This is recommended to be avoided for small skips which was the case. The pitch was also lowered to 2.11 degrees and DFDR data shows speed brake to be still up. The above action was probably taken by the captain to attain a smooth touchdown and reduce the rate of descent on touchdown however; it exacerbates the pitch up tendency of aircraft. of 9.67 degrees which is more than the pitch attitude limit for body/ tail skid contact.  The main landing gear oleo strut which got compressed during the first touchdown might not have gone back to a fully extended position as it takes time, whereby reducing the distance between the bottom of belly of the aircraft and the ground at the time of second touchdown. This resulted in the forward portion of aircraft belly bottom rubbing the ground with consequential structural damage.  The first officer who became PM after the handover of control to the captain could have warned the PF about the excessive pitch. The First officer (PF) initiated flare but the thrust lever was not retarded to idle resulting in Power-On landing causing an aircraft skip of around 2 feet. The Captain (PM) who was supervising the landing had not cautioned the PF to retard thrust levers to idle. In view of the skip, the Captain took over controls (became PF) and initiated recovery procedure by increasing the thrust which should have been avoided for small skip. As the aircraft system sensed the aircraft on ground, the speed brakes got deployed. 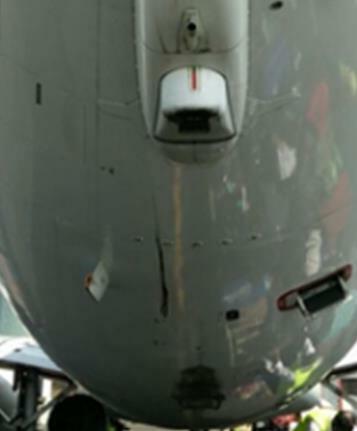 The Captain (PF) raised the nose further to smoothen the second touchdown, which resulted in insufficient fuselage clearance thereby causing the rubbing of fuselage with runway surface. The First officer (now PM) did not caution PF about the aircraft’s pitch attitude.